Time to play at Muse: ChristmasVisions (MCV83) where Stephanie, this week's designer, provided a gorgeous, stunning card for our inspirations. Not only did her card inspire in a number of ways (general theme, colors, continents, ocean, stars, red sentiment); also, a NBUS (and retired die) was used. The ocean was ink blended using two colors of Distress inks. The continents were die-cut from a light green foil DP. A stitched circle frames earth. The sentiment was stamped/heat embossed in red ink/clear embossing powder. The white panels were adhered to a red card stock base. Wish everyone a wonderful day. Thank you for visiting and commenting ... always appreciate your feedback. Fabulous view of the earth! placement of the stars are the perfect touch... love it! What a lovely take on the inspiration photo - I particularly like the stars you added, they're the perfect touch! Love how you did this - those earth dies are amazing - may need to do some shopping! Thanks for joining us at MCV, Marilyn! I love this take on the inspiration Marilyn. Love your frame around the world, and I love the metallic continents and stars. Wonderful! 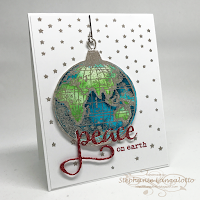 Love how you took all of the elements of Stepahanie's card, including the silver stars, and put your own spin on it.